The so-called “Son of Sam” pulls a gun from a paper bag and fires five shots at Donna Lauria and Jody Valenti of the Bronx while they are sitting in a car, talking. Lauria died and Valenti was seriously wounded in the first in a series of shootings by the serial killer, who terrorized New York City over the course of the next year. The second attack came on October 23, 1976, when a couple was shot as they sat in a car in Queens. A month later, two girls were talking on a stoop outside a home when the serial killer approached, asked for directions, and then suddenly pulled a gun out and fired several shots. Joanne Lomino was paralyzed from a bullet that struck her spine, but her friend was not seriously injured. 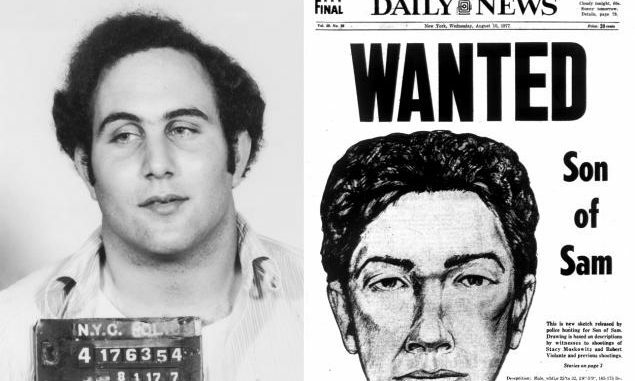 The Son of Sam attacked again in January and March of 1977. In the latter attack, witnesses provided a description of the killer: an unattractive white man with black hair. After yet another shooting in the Bronx in April, the publicity hit a fever pitch. Women, particularly those with dark hair, were discouraged from traveling at night in the city. When the Son of Sam missed his intended victims in another murder attempt in June, vigilante groups formed across New York City looking for the killer. His last twovictims were shot on July 31, 1977, in Brooklyn; one died. Then, police following up on a parking ticket that had been given out that night discovered a machine gun in a car belonging to David Berkowitz of Yonkers, New York. When questioned, Berkowitz explained that “Sam” was his neighbor Sam Carr–an agent of the devil. Sam transmitted his orders through his pet black Labrador. Years earlier, Berkowitz had shot the dog, complaining that its barking was keeping him from sleeping. After the dog recovered, Berkowitz claimed that it began speaking to him and demanding that he kill people. In an unusual sequence of events, Berkowitz was allowed to plead guilty before claiming insanity and was sentenced to over 300 years in prison. In prison, he later claimed to be a born-again Christian.